Floresville is the perfect small town for a relaxing weekend getaway. 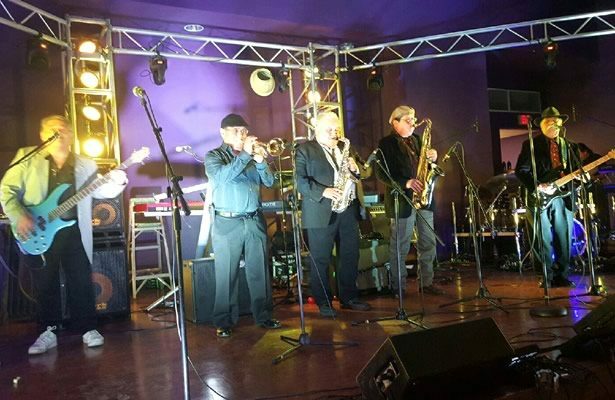 Enjoy the friendly charm of South Texas while exploring historical sites, browsing downtown antique shops, playing a round of golf, or catching a concert or dance performance. 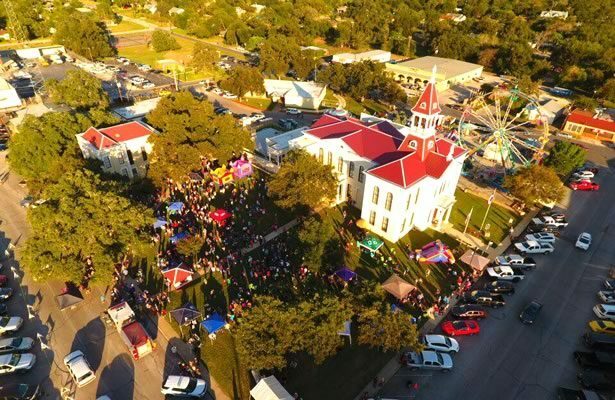 The Floresville Peanut Festival is celebrated the second weekend of October. As part of the San Antonio Missions National Historical Park, Rancho de las Cabras represents a portion of the only UNESCO World Heritage site in Texas. Spanish for “Goat Ranch,” this area was developed in the 1750s as livestock grazing lands to provide food for Mission Espada, 30 miles to the north, in present-day San Antonio. Rancho de las Cabras is a developing element of the park: while a master plan is being drafted by the National Park Service, access to the site is currently provided by periodic ranger-guided tours and field trips. 6420 County Road 144. (210) 932-1001. www.nps.gov/saan. Call for tour information. 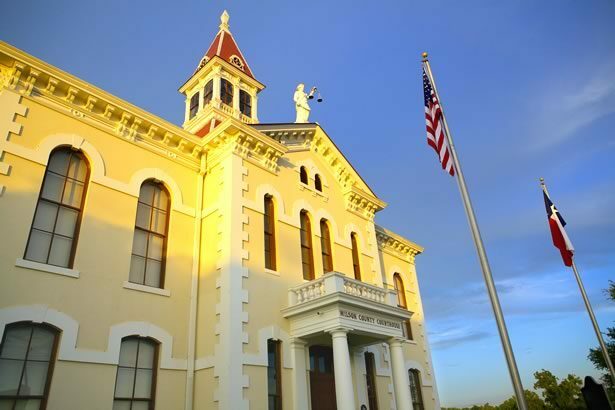 The Wilson County Courthouse, constructed in 1884 and serving as the current seat of Wilson County government, was designed by notable San Antonio architect Alfred Giles. The Italianate style structure was built with locally sourced bricks and features Doric columns, a bracketed roof line cornice, and central tower with a steeple. A statue of the blindfolded Lady Justice holding scales stands directly above the entry porch. 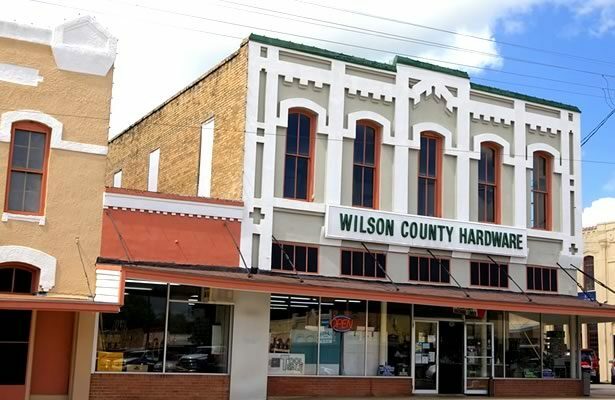 The Wilson County Courthouse was added to the National Register of Historic Places in 1978, became a Recorded Texas Historic Landmark in 1984, and underwent extensive structural stabilization in 2014. 1420 3rd Street. (830) 393-7303. www.co.wilson.tx.us. Free. Monday through Friday, 9am-4pm. Built in 1887 and used as an active jail until 1974, this museum is located on the Wilson County Courthouse square. Although modern utilities have been added, the original jail floor plan and jail cells remain intact. 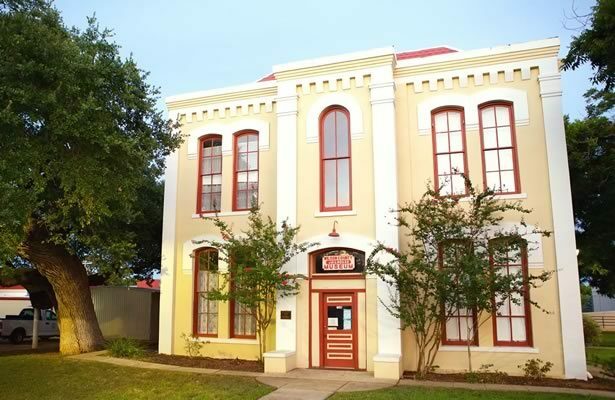 The Wilson County Jailhouse Museum features historical displays, photos, and other memorabilia. 1420 3rd Street. (830) 391-9397. wilsoncountyhistory.org. Open for tours on the first Saturday of each month from 10am to 1pm, and during the Peanut Festival and other special events. This historic residence was originally built in Gonzales, Texas, by Dr. Robert Taggart Knox, sometime in the late 1860s. In 1983, Claribel Dewees Remschel, a descendant of the Knox family, moved the house to its current location on her 130-acre ranch in Wilson County. Reconstruction work was still underway at the time of Remschel’s death in 1996. Though she willed the house and property to the National Trust for Historic Preservation for development into a museum and park, the gift was declined due to anticipated difficulty managing the property from Washington, D. C. Instead, the opportunity was accepted by the Wilson County Historical Society. Today, in addition to serving as a museum filled with historic furniture and household goods owned by Ms. Remschel, the property is available for weddings, receptions, and other events. Six miles south of Floresville at intersection of FM 1344 and FM 541. (830) 393-3385. wilsoncountyhistory.org. Call for tours or reservations. Floresville is located on the Texas Independence Trail and Wilson County is home to 62 state historical markers. 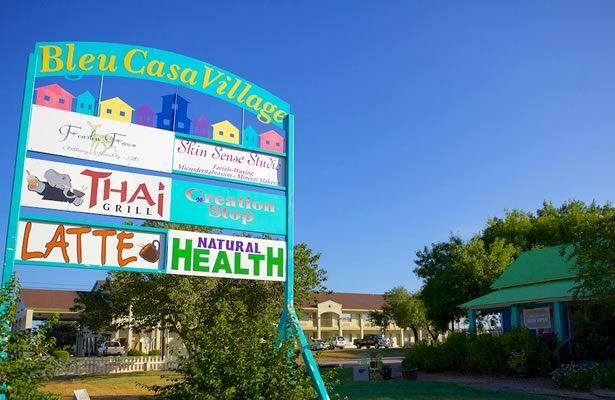 Shops, restaurants, and lodging abound in historical downtown Floresville and along the Highway 181 corridor. Shopping opportunities range from antiques and specialty to supermarket and big box stores. 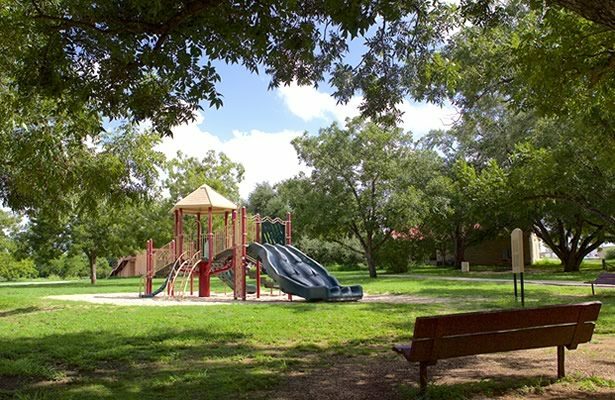 Floresville boasts 82 acres of parkland in seven city parks and plenty of things to do. If your sport is soccer, baseball, basketball, tennis, or golf; or if you prefer canoeing, or the hike and bike trail, we’ve got you covered. 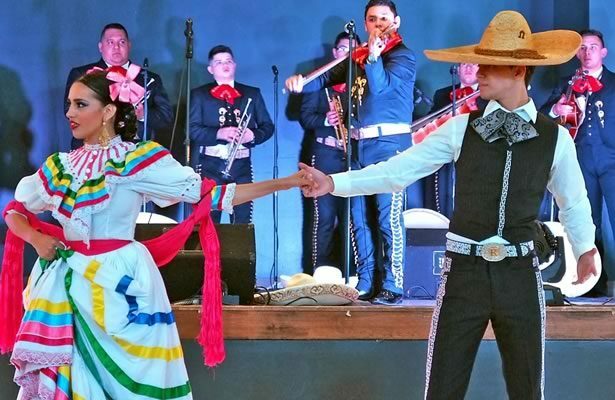 We love to showcase our culturally rich heritage and diversity with Friday night football, mariachi bands, Tejano concerts, and classic country music and dancing. Or catch a movie at the historic Arcadia Theatre downtown. 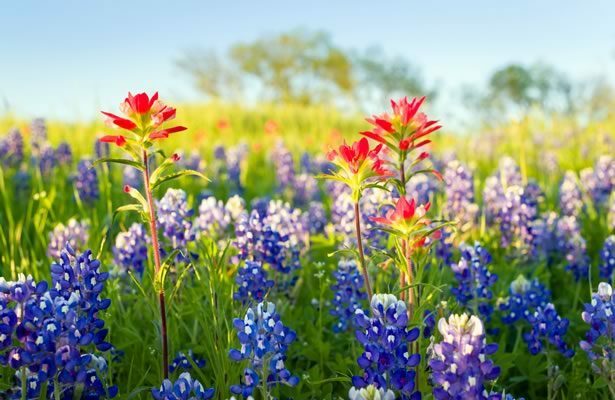 Bluebonnets and Indian Paintbrushes—a few of the wildflowers that abound in March and April. 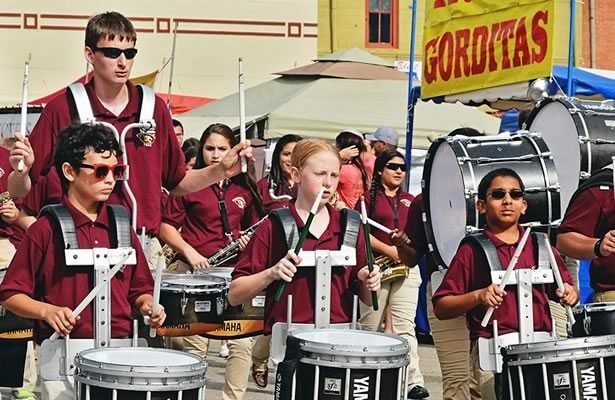 Floresville High School marching band at the Peanut Festival in October.